Site plan for 8120 Santa Monica Blvd. (Courtesy of City of West Hollywood). 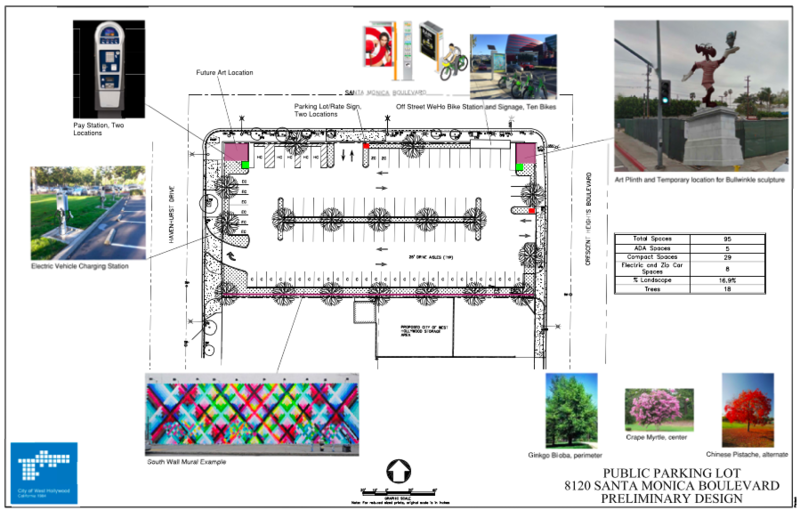 Local residents and business owners had mixed reactions last night to a proposal to put a parking lot on the lot at 8120 Santa Monica Blvd. bounded by Crescent Heights Boulevard and Havenhurst Drive. The lot, which would have 95 parking spaces, would be an interim use of the property until the City of West Hollywood develops a final plan for the one-acre lot, which it purchased in 2015 from Walgreens for $7 million. Oscar Delgado, the city’s director of public work, said plans are to include art works, including a temporary installation of the famed Bullwinkle, which eventually will be placed at the Sunset Spectacular project on Sunset Boulevard. The lot will include Ginko trees along its border with Santa Monica and crepe myrtle trees in the center of the lot. Helen Collins of Public Works said the city has removed possibly toxic soil from a dry cleaner previously on the lot. Delgado described the proposed lot as “multimodal,” noting there will be six electric vehicle charging stations, possibly two spaces for Zip short-term rental cars and a WeHo Pedals bike station. Delgado said the parking meters will accept credit and debit cards and eventually Google Pay and Apple Pay payments. And monthly parking permits on the lot will be available. A rendering of the original Walgreens lot plan. Some residents objected to adding more parking to their neighborhood, saying there already is enough. Graciela Iparraquirre said a better use of the property would be as a park that includes a place where dogs can play. Iparraguirre said there already are 241 parking spaces in the area, which includes the 200 spaces in the automated parking garage behind City Hall on Sweetzer Avenue, three blocks away. “We need a pocket of sanity,” she said, advocating for the park. Local resident Dan Morin said he saw a contradiction in the city’s claim that it wants to make WeHo more walkable and get people out of their cards and also wants to add more parking spaces. Delgado said the lot had to have some parking-related function given that the city paid for it with money from a city fund dedicated to parking whose revenues come from parking fines and permits. He also said the lot will help fill a gap in parking resources because the city’s lease of the parking lot at 1114 N. Orange Grove Ave. soon will expire. That lot, four blocks east of the 8120 Santa Monica lot, now accommodates 45 cars, and Delgado said the property owner does not intend to renew the lease. Delgado said that, based on the public input, his office would consider adding more green space to the lot. Marco Cappani, whose Marco’s restaurant was displaced when Walgreens began demolition on the 8120 Santa Monica lot a decade ago, now operates that restaurant from the southwest corner of Havenhurst and Santa Monica. He said those working in his restaurant have trouble finding parking and have to look for spaces on Havenhurst south of Willoughby Drive in Los Angeles. “I’ve had customers come into the restaurant and say they have driven by so many times and can’t find a place to park,” he said. David Noe, another resident, said that converting the lot into a park would mean it would attract homeless people. He said his guests have to park three or more blocks away in Los Angeles to visit him. Plans for the lot have been contentious since Walgreen’s bought it 10 years ago for a reputed $3.5 million. The pharmacy company demolished popular local businesses such as Tasty Donut and Marco’s restaurant and unveiled plans for a multi-use project that drew opposition from local residents who formed a “No Walgreens” advocacy group. The project would have included a large Walgreen’s store and 28 apartments and offered a left turn lane for drivers on Crescent Heights Boulevard headed north toward Santa Monica. Plans for the project dragged on for a number of years until in 2015, Walgreens, whose financial problems forced it to close 200 of its 8,232 drugstores in the United States and the U.S. Virgin Islands and Puerto Rico, offered the land to the City of West Hollywood. Delgado said it is impossible to project when the city might move forward with other plans for the lot. He said his office plans to hold another neighborhood meeting in the next 45 days to get more input on the plan. I don’t understand the complaints about parking from some of the people here. There is a lot right across the street on Havenhurst where I have always been able to find a space. In fact I meet friends at Marco’s for Sunday lunch for the very reason that we know parking is not going to be a problem. I park in that lot on other days as well and there are always plenty of empty spaces. I’m less concerned about what it is used for temporarily – if surrounding residents and businesses can temporarily benefit from additional parking, fine. If that includes a small pocket park or green space, fine. The City and residents need to work together and think longer term to fully realize the treasure of this piece of property in the center of our City. Santa Monica and Crescent Hghts. would not be a suitable location for a MTA light rail stop since it is not a transfer point to local bus lines. If constructed Fairfax Ave. will be the desired transfer point. With that said as a former MTA employee it is my opinion that the Crenshaw Light Rail line will not run along Santa Monica Bl. Yes, it will run thru West Hollywood as promised but that will be via La Brea Ave. from either Venice Bl. or San Vicente Bl. Why would they build a line that crosses several streets more than once and not connect with the Purple Line? The nearest Purple Line stop as many believe has been proposed is either south of Wilshire Bl. on La Brea approximately one mile or approximately a quarter mile of the La Cienega stop as the light rail line travels on San Vicente. The city and it’s voters were convinced to vote for and push measure “M” over the top for passage with a half hearted promise for line rail service thru the city when in fact it unfeasible and to costly to fallow this convoluted route. Do we need light rail service on Santa Monica Bl.? Yes, but not just thru West Hollywood. A bit of history. The extension of the Glendale Freeway, State Route 2, was killed by Governor Jerry Brown during his prior rein. Century City and much of the westside were developed with said freeway promised. What is needed is a light rail line extending from Downtown Los Angeles to the City of Santa Monica or at least Supulvada Bl. where it could travel south to the Expo Line and interconnect with it to Santa Monica. Traffic during the afternoon commute becomes gridlocked eastbound from Centanella on Santa Monica Bl. and approximately Bundy Dr. on Sunset Bl. There is little north-south connecting bus service west of La Cienega so commuters in cars and trucks have limited access to both the Expo Line or Purple Line. This busy commuter corridor has been completely ignored by those at the MTA while they study a extension of the Gold Line to the San Bernadino County border and into that county to Montclair Plaza. Another proposed line will parallel or share tracks south along the Blue Line from Downtown Los Angeles for several miles. We need to demand a real solution to the grid lock we all experience not just in West Hollywood. It’s a regional problem which to date has never been addressed. LIGHT RAIL LINE: first – I think it would be awesome. IT WILL NEVER HAPPEN. SMB, SUNSET, FAIRFAX Are already way too narrow for the massive daily traffic. Light rail would require 2 lanes devoted …. There is no physical way light rail (above ground) will ever fit on any east/west or north/south weho streets. Please don’t respond, but if they put light rail in, so many people would use it, there would be so much less traffic so losing 2 lanes would make it faster with light rail. ABSURD. But I am all for public transit, and I think ALL Buses should be FREE – giving people a real money savings, and a windfall to the regular riders, who are mostly the poorest of the society. Follow up: My suggestion for free bus (and subway) Will Be very expensive – but compared to the cost peer mile of a subway line, it would be a bargain, traffic would drastically be reduced. I think there has to be BIG park and rides like valley, city, airport, southbay. All new clean fuel busses. Tax the wealthy for parking, the rates getting higher the more crowed the location. Buses in such numbers would make wait times short. (the new long buses are very nice, A/C and big multiple exits. At I think more than 2 billion per half mine of a new subway line has to be way more than free, clean free bus/suways. Please look up the definition of “interim use” when referring to your position re: parking lot??? Mixed-Use, promenade and green space should be focal. To all of those that persist in presenting their ideas and opinions in a shrill demeanor , perhaps you can move ahead to having calm, meaningful sit down conversation with the council member of your choice. Excoriating them into doing it your way just ain’t gonna happen. No, Manny, we were all listening very closely. Maybe if you had been there, you would understand. But you didn’t participate. At least, we did. A parklike parking lot with pea gravel and lovely trees……crepe myrtle and ginko trees. Will that make everyone happy? Perhaps not, some will undoubtedly complain about the trees shedding on their cars. @Dan Morin…Maybe the 11, like yourself, weren’t listening. You should celebrate this purchase, understand (and believe) that the parking lot is TEMPORARY and look forward to and participate in the process of developing a permanent and useful use for this land. Don’t be so negative, it’s going to be alright. I don’t recall mentioning a park but I certainly did state that the site should be for affordable housing. As John Heilman stated when the two houses adjacent to Gelson’s were slated for demolition that if the city owned those two lots, affordable housing would be on that site. I reminded Mr. Heilman of his comment at a subsequent City Council meeting, after the purchase of the land at SMB and CH. Since then – deafening silence. The rationale that Mr. Delgado provided for having a parking lot was that the land was purchased with parking funds. But that logic would require that the land ALWAYS be a parking lot. And, my friends, I’m certain that that is what it will remain, no matter what residents have to say. BTW – I took an impromptu poll at the meeting. Of sixteen (16) residents who attended, eleven (11) were opposed to the parking lot. Do you think this will make a difference? Don’t hold your breath ! J Simmons. Guess you and i aren’t reading the same story. 1) You keep repeating in your comments stuff about the toxic waste. The story says the city has removed that. 2) You keep repeating that Walgreens sold the lot because of the toxic waste. The story says Walgreens sold it when (I guess cause of financial problems) it had to close a lot of its existing stores (why would it build a new one if it was closing 200 existing ones). 3) You keep implying that the city paid too much for the lot — suggesting some corrupt behavior. But Walgreens bought the lot for $3.5 mil and sold it for $7 mil. 10 years later. Guess what? Real estate prices have more than doubled over that 10 year period. Your comments would be more interesting if they were shorter, not written in capital letters — which is the email symbol for screaming, and if you actually read the stuff you commented on. Everyone needs to realize that the parking lot is just a temporary solution. Something more permanent will eventually be built on that property. That said, there’s no reason the city couldn’t add the needed left-turn pocket on Crescent Heights and improve the sidewalk while they are grading the parking lot. While I’d rather have another affordable housing complex with public parking built into it…I think this is a logical solution. But I would lose the entrance/exit from Santa Monica Blvd. I think that will be a mess with traffic backup and dangerous for the silly people trying to turn left from the lot or zoom across to get in the turn lane to go northbound on Crescent Heights. I’d keep the entrances off Havenhurst and I guess Crescent Heights too but only allow a Right Turn Only when exiting onto Crescent. And I’m just curious…why cant we build a parking structure to allow more parking? If we can build an 18 Million automated parking structure…I would think a double story parking garage wouldn’t cost nearly as much. Sorry to repeat: But the whole problem with the lot is underground Toxic Waste. So long as the ground remains undisturbed, there is no triggering of the Federal Toxic Site Cleanup Requirements. A rational double deck parking garage you suggested, would require major reinforced pilons dug and put into very deep holes to be the framework and foundation for any normal two story parking garage. But the inability to disturb the soil makes ANY AND ALL BUILDING OF ANYTHING ON THE LOT IMPOSSIBLE BY FEDERAL LAW. All of which is why the developers dropped the years of Planning for the Walgreens” project as it was known. it was shocking to see all the prep and the tearing down of the old strip mall, and then a sudden stopping of all work, fencing the lot and ‘getting out of town” in less than 2 days. So the city is just making a big noisy show asking what people want there, knowing NOTHING CAN BE BUILT, and they have a fully complete over 300 page detailed plan for just a flat lot parking. It may or may not be approved due to the known toxic site. But the city is carrying on getting people excited with their ideas, which turns bitter with everyone else having a different idea, squabbling to make enough noise to keep people from realizing the city has already decided and prepared a huge plan for a flat lot. It is really a nasty way to get residents emotions bothered knowing no idea can be used, but to hide what seems this time a very obvious scam to embezzel or some how take and misuse the absurd $7 million dollars the city paid the Walgreens Developer who ran ..for a contaminated lot, worth far less than the Walgreens paid for it, and possibly worthless as nobody would buy a lot with nothing but massive liability underground & no ability to build or use the lot. Sorry… It’s not my desire or opinion …It is Federal Toxic Clean Up Act that the City knows prevents any building on the lot .. DESPITE THE BIG WIDELY ANNOUNCED MEETING FOR RESIDENTS TO SPEAK AND GIVE IDEAS FOR THE LOT. How about public bathrooms and showers combined with agencies that serve the homeless and other underserved demographics? Now I’m sure nobody wants to attract more homeless to their street. Too late. They’re here. They’re fellow human beings. They’re not going anywhere. Why not be a leader in being better humans? For most of us, living here is proof enough that we are blessed. Gentrification is a cannibals compliment of sorts after all. A public/private venture bringing all the various resources needed to make an actual and meaningful difference. Or a dog park is cool. When one looks at the property and notes it’s depth everyone can be appeased with a project as I have previously described with spaces provided to organizations that provide charitable services at low or no rent on the first floor with affordable apartments above. But with said depth the project could be constructed in a “U” shape with a small park, green space, in the middle and underground parking. With the soil removed perhaps for two floors underground much of the contamenation would be addressed. While I do not live near the intersection I have seldom observed homeless utilizing the two spaces across the street. On the other hand I have observed homeless at the War Memorial Park at Santa Monica and Halloway which I do live near. It seems the Santa Monica and La Cienega area attracts homeless day and night. Please make the sidewalks wider on all 3 sides—-they are barely 4 feet now. It would be nice if the city allowed some of these spaces to be 30-minute free lots for ride-sharing cars. I hear that complaint a lot that this is the busiest area in the region but they have nowhere to park during the lulls, end up driving to another area & then right back to Weho. It would be advantageous to do some sort of partnership with Lyft &/or Über. What has happened to property value since 2015?……I’d say the city got a great deal. We should be really happy about this land purchase. Especially at a time when there ain’t much land left to be had, at any price. Well with Crepe Myrtle and Ginko trees we could consider pea gravel rather than asphalt to make it environmentally correct. This is what the “Creative City” offers? I can understand that land has greatly increased in value since Walgreens started this long, protracted, ultimately Quixotic process. However, once the soil contamination was discovered (which was known because of the cleaners), it should have devalued the land by the remediation costs. Perhaps this was done? I don’t know. It would be helpful for the City to disclose how the property was valued. If they paid an outside appraiser, and the appraisal didn’t take into account the environmental costs, then there would be a cause of action against the appraisal firm. If the price was a nice way of bailing out the developer/Walgreens, then we have a real problem. Ironic that this land was taken from local businesses and now Weho is wondering if local businesses should be housed there. I have said it before and I will say it again: This land should be used to give office space to nonprofits that have been misplaced or who have shuttered their Weho doors due to high rents and development which kicked them out of their original place of business. Why can’t Weho give one corner of the city to the workers who are doing the hardest, most important, yet often times, the least paid work?! As someone who lives in an apt a block from the property, I suggest we be real: Any parking lot/park will be turned into a homeless camp. As a recent Wehoville article wrote, the homeless population is up 30%. With our Weho Sheriff Dept doing nothing about the homeless who have parked themselves in and under my apt building, I can guarantee that any homeless person(s) in a parking lot/park will get even less attention and concern from our law enforcement. Unfortunately, Weho is now faced with using the lot for businesses (which we have enough empty store fronts along SMB already) or else any unsupervised piece of land will be taken over by the homeless. Give the lot to nonprofits who need space, visibility and support! I understand your personal concern the impact will have being so close to your home. Hopefully we can become a group of like minded – for whatever our own effect may or may not be – THIS IS A BAD ACT; MONEY,l LARGE LARGE AMOUNTS ARE BEING SPENT TO BUILD SOMETHING NOBODY CAN BELIEVE IS IN ANY WAY A “KOSHER” ACT BY THE CITY. THIS PARKING LOT IS SPECIFICALLY “UNWANTED” AS EXPRESSED BY A RESIDENT WHO WILL HAVE A VERY BIG NEGATIVE IMPACT ON HER HOME AND SAFETY IF WE DO NOT STOP THE CITY AND STAND OUR GROUND ON THIS PROJECT.. ENOUGH! LET’S START A MOVEMENT: if ignored – I am prepared to protest physically with civil disobedience blocking any truck from ever entering the lot to beging by SITING IN THE DRIVE WAY USING MY PASSIVE BODY AS THE FIRST IN A HOPEFUL SIT-IN IF WE ARE IGNORED AND THE CITY ATTEMPTS THIS PARKING LOT. AGREE! That is officially a group of TWO like mined residents who may find others who can not see what is really going on. Thanks! Underground parking, park on top. Case closed. Why the sudden move to try to get use out of the lot the City Purchased as @fine7760 pointed out) for twice the value, after Walgreen dropped their long expensive fight to get a development there. The double price, KNOWING NOW THERE IS A MAJOR TOXIC CLEANUP IN THE GROUND OF THE LOT? The left over toxic leakage from the gas station that was there before the strip mall is Official and Recorded with the Property Deed by the Recorders Office For the County of Los Angeles. Why would weho buy the lot for twice the value, once it became known of a toxic clean up site made “walgreen” project impossible. They say follow the money. This latest plan is being publicly discussed in formal meeting tonight. On the record. Lying or misleading by omission By Elected City Council Members can be all that is needed. (it’s very Trump-esque … thinking they can so easily get a bad money deal past the residents – via the formal recorded pubic meeting going on). The Recorder’s Office with an official copy of the property’s history, and the recorded meeting tonight might say it all about why $7 million dollars was spent to bail out the developer of what was called the walgreen project (I suspect Walgreens was to be the main Anchor Tenant, and the developer hoping for a big profit, would lose millions after the toxic waste was confirmed. 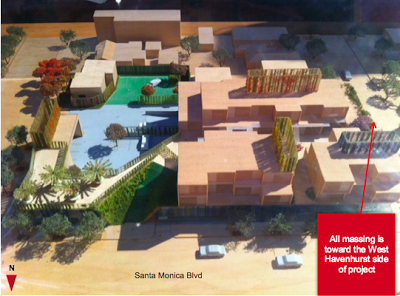 But weho BOUGHT THE LOT WITH NO PLANS FOR IT”S USE AT DOUBLE THE PRE-TOXIC WASTE REPORT? The lot was near useless as the city so eagerly spent $7 million in a private off market sale and purchase by the city. That’s what you get for opposing a sensible mixed used development on it. You get a parking lot. You get a parking lot everyone gets a parking lot! Sounds like a great idea. A parking lot to serve the businesses and keep cars out of the neighborhood. Perfect temporary use until a permanent project is approved. The woman that spoke about a park is clueless. Creating a park is not like putting in a new front lawn. It’s costly and requires lots of resources and maintenance. I’m glad she’s not the city’s treasurer. Why not a dog park, and 50 parking spaces, say 45 metered, 5 electric charging spaces? I agree that if it becomes a parking lot, it will be long term. Possibly toxic soil? How do you clean it AND dispose of it if you don’t know what it is? If the land must have parking spaces, then why don’t you tell us how many parking spaces the City wants, so we can give input on the rest of the property? I didn’t read this post until late yesterday afternoon. Had I had time, I would have liked to walk to the meeting. THAT IS EXACTLY MY POINT. THIS WAS A MISLEADING SHOW – to get the locals in a stir, lack of facts, opposing ideas … all for a not disclosed plan in place by the city. $7 million they paid for the lot. Assuming they make it a flat parking lot. HOW MUCH PER PARKING SPACE WOULD THAT BE … $7 million divided by whatt 20-25 parking spots. That’s CRAZY .. but the city does this all the time with the never ending big box multi use then the switch to the HOTELS ON SUNSET … which they have spent years planning … and nobody knew for years when they announced the first of the giant hotels. And all meeting .. did they say “DUE TO THE BROWN ACT” we people can speak, but nobody on the council can respond to anything the speaker says??? The Brown Act does NOT say that. The Brown Act was written and passed into law to stop little cities like weho from doing what they want with no ability for public input. The law wants the public to be able to give input and interact or ask questions of their small local elected city officials. The city, under Heilman’s reign, MISLEADS EVERYONE about the Brown Act preventing them by law from speaking during the peoples open speaking times. And there is no 2or 3 min max time in the law. sorry – all this was to distract everyone and stop any surprise when the first big construction truck shows up. I am trying to point out what the LAW will do and affect the ability of the City (the quiet overpaying new owner of the years of squabbling over the walgreen project). I am not taking a side or opinion about what I think should be done with the law. Just saying there are almost no options available in the very unusual situation – I think they are pressing their luck trying for a parking lot. The city paid twice as much for the property than Walgreens paid? Who negotiated that deal? The restaurant on the corner and the cleaners were never replaced, they went out of business. Marco moved to a larger space but I doubt Tasty Donut is doing as well where they moved to especially since they are no longer open 24hours.